You might have seen those official notices informing you that you could be party to a class-action settlement with a company. There’s a nifty website that will help you keep up on these notices so you can receive proceeds to these settlements. I was honestly amazed by the number of these multi-million dollar settlements that happen every week. I’ve always thought class-action suits were more rare, but after a few minutes of browsing this website, you’ll find that you might be eligible to file a claim. I’ve also presumed that one had to receive one of those printed notices first to make a claim – but this isn’t the case! I’m no lawyer, but this is my understanding. When law firms have a formidable case and they are confident there can be multiple people who would be party to the suit, they seek a higher court to grant a class-action status of the claim. Then they consult with the company in question. If the company feels it is more cost-effective to agree to a settlement, they will take the settlement offer. If they feel the claim is without merit, they will fight it. So, when a these matters are settled, a court will bind both parties to an agreement that they must notify consumers in a timely fashion – often with those postcards via US mail. They often also create micro-sites dedicated to the settlement often with very blunt language, access to the court documents and details about the settlement administrators. But, what if you moved and no longer have forwarding on your previous addresses? You might not hear about these settlements. I discovered Top Class Actions when it was mentioned in an article authored by consumer advocacy reporter Joe Ducey from ABC15 KNXV. Top Class Actions was cited as the source on a few noteworthy class actions that many consumers could use in their research. 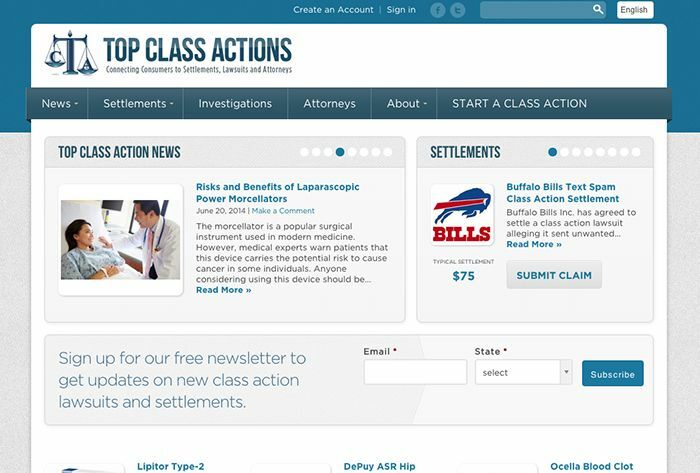 On the site, you can browse updates on class-action settlement news and insights and is free. The content and depth of coverage is makes this a top site that I’ll continue to follow and provide my email address for upcoming posts. Don’t expect to get massive checks and certainly not overnight. I remember I once received a settlement years ago for a cellular company for only a few dollars. However, if you genuinely feel that you are party to such a claim, meet the criteria for the settlement and are comfortable that you won’t sue that company again, then getting that mystery check months later is a nice surprise. So, what do you risk? As a consumer, a settlement means that you irrevocably waive your rights to bring that company to court on that matter in the future. This could be serious; say you settled with an automotive manufacturer on a faulty seatbelt and later on, you get into an accident with substantial medical bills. If you received a settlement of any amount, you limit the ability for that manufacturer to be compelled to pay for your damages (assuming you even had an iron-clad case). But for most other consumer products and services, there is limited risk and the companies that make these settlements are doing so with the assumption that most people won’t respond. So, it makes sense to follow settlement news. At the very least, you’ll be aware when big companies make mistakes. At best, you’ll get a mystery check in the mail months later. Check out Top Class Actions to learn more about large class-action settlements and links to the claim forms.